4-H National Science Experiment – Biofuel Blast: Get your results in! Throughout the month of October, 4-H is collecting the user’s experiment data for their 4-H National Science Experiment – Biofuel Blast. In preparation for that, we’ve created a Flash ‘quiz’ to collect all the user data. A new database table handles the results and ties into the previously created registration table. It was a pretty straight forward assignment, but shows the great potential Flash has as a serious application Front-end. We are proud that we could help support the 4-H organization. 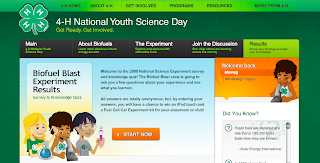 Posted in 4-H.org, dashboards, database, Flash, National Science Experimet - Biofuel Blast.